Bio: Cyclonus uses mind control to combine with any bot, siphoning the powers of whichever Autobots or Decepticons will serve his purpose of unleashing chaos across the universe. Cyke. Love Cyclonus. He's a character I enjoyed throughout the future-verse stories with his buddy Scourge, back in the day which made them both memorable and fun. Despite being, y'know, evil and all that. I was genuinely horrified when he got his head ripped off by Megatron as we tumbled into Time Wars – one of many visceral images Marvel UK's Transformers title etched upon my young brain – and further shocked that Shockwave ended up turning his decapitated body into some dreadful modern art installation. More recently, I've been loving James Robert's portrayal of the character as someone with a lot going on behind that brooding facade...and singing. Needless to say, he's recently endured another horrible death (hopefully permanent, Mr Roberts!) which has left me beside myself. Cyclonus was also one of the best things about the original cartoon's third season, being a dry, sardonic presence throughout. Sadly, every toy he's got has been absolute arse in my eyes. The 1986 movie toy struggled turning such a sleek spacecraft into a decent robot, leaving us with some abhoration with pipecleaner legs, great big mitten hands and the Man With The Stick's paper helmet for a head. It looked crap. Fast forward to the future space year of 2008, and the Universe imprint gave us a Deluxe scaled nipper that got the robot mode pretty much bang on, but the alt mode was a compromised floating barrel of poorly pegged together arms and split apart legs. Although universally praised, I still find it a deeply unsatisfying toy which needed to be at least Voyager scale to do the character justice. Be careful what you wish for, right? 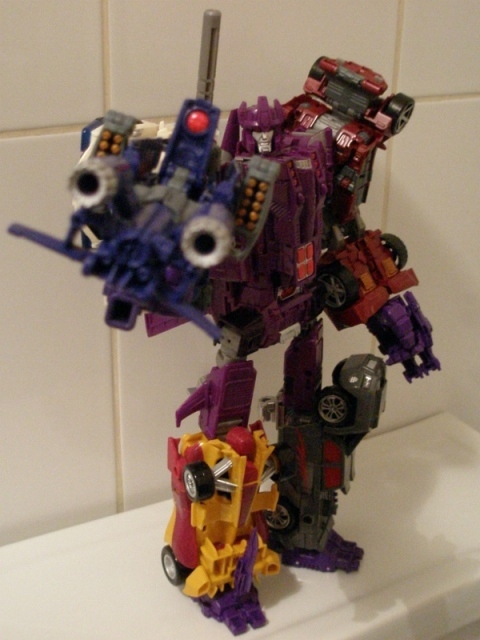 Combiner Wars has turned out a new Cyclonus toy. Sadly, its a retool of Combiner Wars Silverbolt. Not a bad thing in itself, at least at first glance. Shame its just not third time lucky. 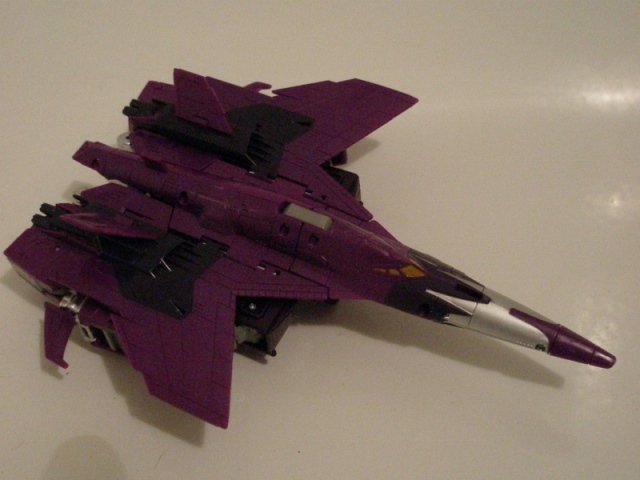 Robot Mode: He's so purple! Oh my, this is all kinds of brilliant. He's a really nice vibrant shade of purple with some nice darker purples for his feeties and shoulders, plus those chevron marks on his arms. Some nice silver highlights on his midrift, hands, face and thighs, along with some grey plastics and flashes of red really make him pop. The rich hue of purple does a much better job of picking out all the cool details in the mould that Silverbolt's smudgy off-white failed to do and it makes him look all nice and crisp. He's got a nice stern grimace on his face and I actually think he looks pretty amazing. 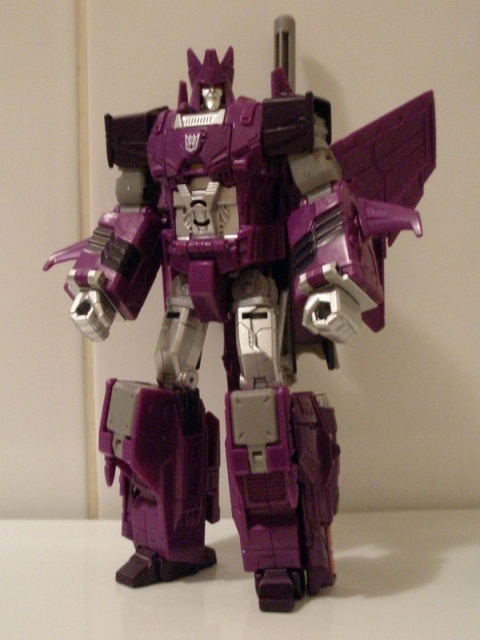 Okay, he's not as sleek as I'd like, as the mould is just far too boxy and bulky, plus the kibble here strangely feels more obtrusive on Cyclonus than it did on Silverbolt, mainly due to the larger wings. He comes with a straight grey repaint of Silverbolt's awful drainpipe gun, which looks just as pap as it did on Silverbolt and its a shame Hasbro didn't think to dig out Nightstick again as I'd have preferred his Targetmaster partner over this load of nonsense. 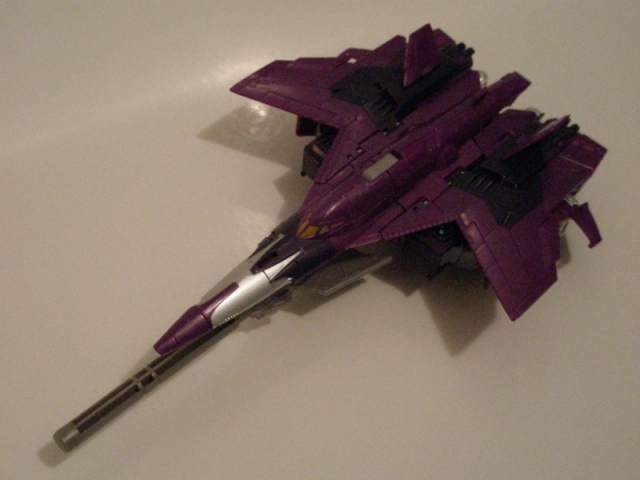 Alternate Mode: From the top down, Cyclonus loks pretty mega in his alt mode. What a difference the bigger size makes! This is more like it. It's sleek looking and mixes in some bluey-black into the alt mode. Pleasingly, the orange windows like the original '86 figure had have been carried over to this new upgrade. As with Silverbolt though, the underside is a clumsy jumble of not at all concealed robo-parts. 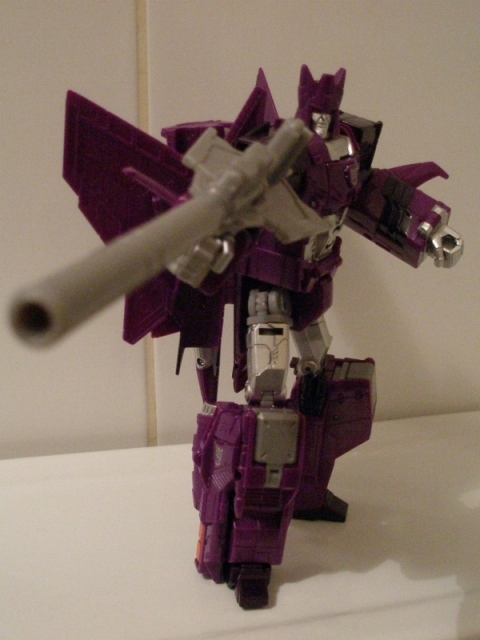 This stops Cyclonus looking quite as awesome as he should, but I still prefer this over his two previous toys. He has some flip down landing gear under the nose cone and some moulded parts on his folded up legs that give the illusion of wheels. You can of course clamp the gun under the cockpit for a cocaine-snorting jet mode. 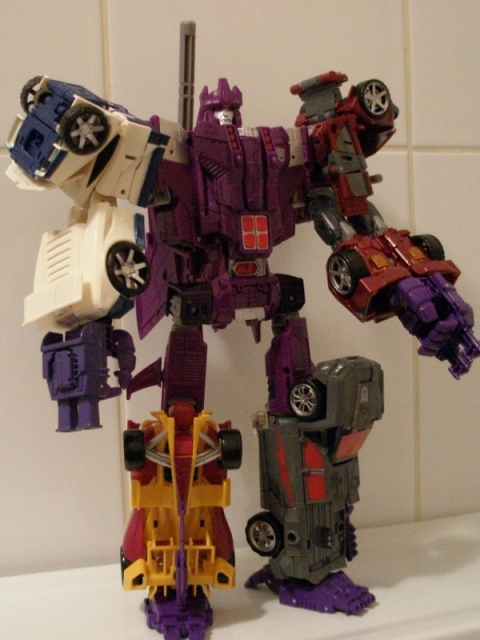 Alternate Mode: This being Combiner Wars and Cyclonus being a retool of Silverbolt, he can also form a torso and bring Galvatronus to the battlefield, seizing any limb-bots that might be in the vicinity. Whilst die-hard geewunners may roll their eyes at this, I really like it. Its a boss looking mode that apes the future Decepticon leader brilliantly and I like the additional play options this brings to the table. The detailing is again spot on, with the red tummy bits and cracking combiner noggin going on. Its just a really great extra to have.